Soup known round the world as a nutritious meal, especially this time of year as we stave off the cold of winter, we know that fresh, hot soup is a perfect light lunch when paired with fresh baked bread. 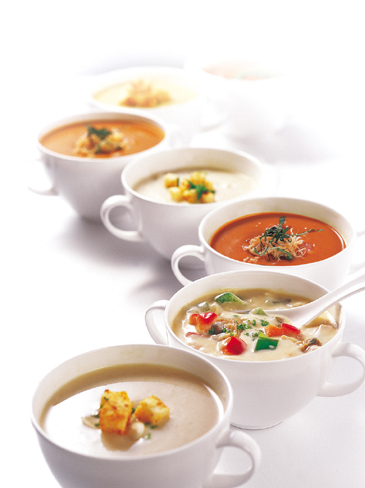 And to start the New Year off right, Delica-Hans Sidewalk Café & Delicatessen at the Lotte Hotel Seoul will present a host of healthful soups beginning January 1st 2006. Nine delicious soups are among the offerings and include "Minestrone," the healthful Italian-style vegetable soup, "Chicken Noodle Soup," a light-tasting traditional soup made from abundant amounts of chicken and noodles, "Pumpkin Potage," a healthful soup with delicious pumpkin flavor and aroma, "New England Clam Chowder," a creamy chowder chock full of clams and vegetables, "Hungarian Goulash," a thick spicy Hungarian soup with beef and vegetables, and "Lobster Bisque," made from fresh lobster and other prime ingredients. Prices range from 5,000 won to 7,000 won including VAT, and any of these delicious nutritious soups can be prepared for take-out.